Slots producer Wazdan is to showcase two new games at ICE London, further bolstering the line-up of 105 HTML5 casino games. The Maltese firm, which has lately been forming partnerships with many well-known operators, is recognised for its dedication to innovation through its features including Volatility Levels, Energy Saving Mode, Double Screen Mode, Ultra Fast Mode, Ultra Lite Mode and the Unique Gamble Feature. Continuing with its commitment to release new games every month, Wazdan will be announcing February's two new launches to the crowd at the ICE London event. 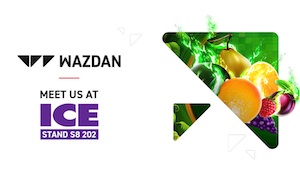 Wazdan can be found on stand S8-202, where the team will share its passion for games, meeting industry peers, answering questions and showcasing its newest gaming products before launch.